The National (Miss J Startup), SKC (Mr T Thorn), Paignton Champ Show (Mrs Z Thorn-Andrews), Hound Association (Mrs D Kenis-Pordham) and WKC ( Mr N Ziman). He remains unbeaten by any other puppy at all his shows so far. 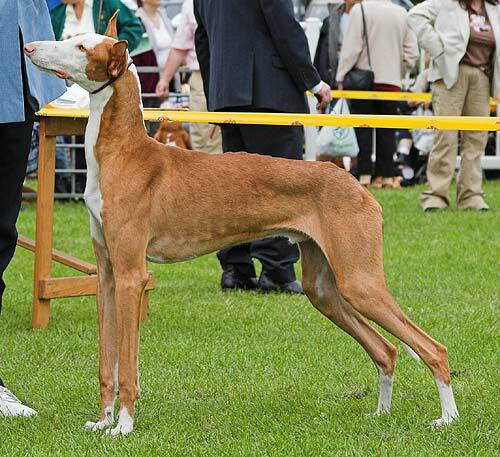 Luger is adored by his owners, Tieryn and Maria Clark, who are about to become the youngest ever Ibizan Hound Breeders (we believe) with their litter due out of Benjique on a Prom Miss, by Int Swe/Nor/Eng Ch Rosenhills Austin Windrush to Benjique. Tieryn, we also believe to be the youngest Ibizan handler (at the tender age of 10) to win a CC. She won with Luger's Grandmother Siete Acoma at the Hound Association Show 2005 under Mrs D Kenis-Pordham. Congratulations to all at Canisbourne farm on their success.